If you have like me a laptop that you sometimes uses alone or docked in different setups. Two external screens at work, one smaller externa screen at home and projector in conference rooms. All these setups makes me rearrange my windows inside of Visual Studio like hiding, docking or just removing them. Instead of doing this every time I can save a setup and then just switch to the desirable one. 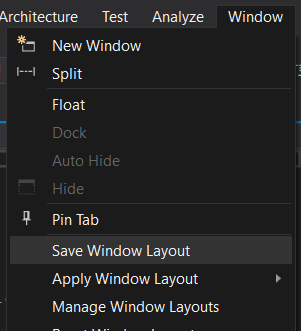 On the menu Window you can find the layout option: Save Window Layout and Apply Window Layout. First one to save the current layout and the second one to switch to a previous saved one. You can always return the focus and marker to the coding windows by pressing the Esc-keyIf the shortcut doesn't work have a look at "why shortcuts doesn't works"